Brad Steiger was born as Eugene Olson(b) in Fort Dodge, Iowa in 1936. He is the author of over 150 books and thousands of articles on a variety of subjects, such as crime, spirituality, UFO’s and other unexplained phenomena. He has written three books related to Atlantis, but in the main they are re-workings of old and sometimes questionable material. Steiger subscribes to the ancient astronaut theory and concluded that Atlantis can only be found at the bottom of the sea. 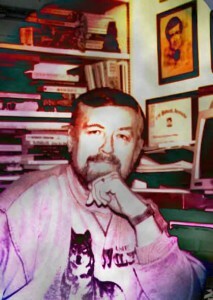 His book, Atlantis Rising was republished in 2007. He reiterated his belief in the ‘Sky People’ in a December 2012 interview(a). In March 2016, it was announced by Nick Redfern that Steiger’s 1974 book, Mysteries of Time and Space, was to be re-released, which prompted Jason Colavito to write a brief but scathing review(c) of Steiger’s work. This prompted online exchanges between Colavito and Redfern. Brad Steiger died May 6th 2018(d).